NOTE: The Bubba Keg has been re-branded to the Big Steel Keg. If you're a frequent visitor to GrillandBarrel.com, you know that I'm the proud owner and devotee of the Big Green Egg and that I've been evaluating a Bubba Keg for the past couple of months. Well, on Sunday I had the chance to do a side by side comparison and share the results here. One of the things the Bubba Keg is missing is the array of accessories that the Big Green Egg enjoys. This includes an accessory for cooking indirect. While the Big Green Egg has the platesetter, Bubba Keg owners are left to their own devices to create an indirect cooking solution. Many of the Bubba Keg owners have resorted to pizza stones on the bottom grate, but that cuts your cooking capacity in half. Recently, I repaired a busted platesetter that I had lying around. I then discovered that it fit perfectly inside the Bubba Keg, making the indirect setup identical to the Big Green Egg without sacrificing one of the cooking grates. 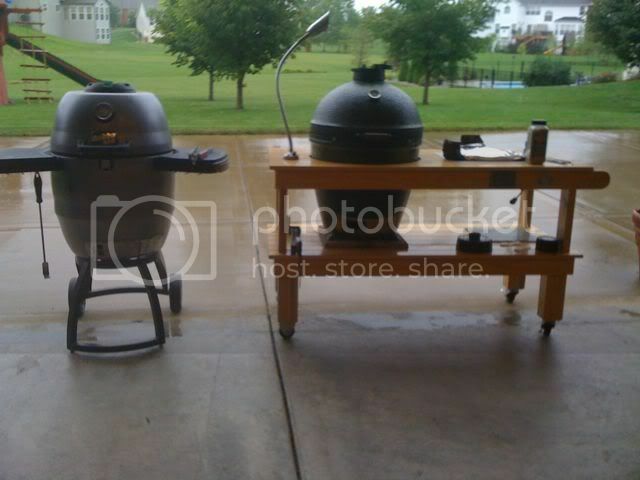 With identical setups between the two cookers and the need to smoke ~20 pork steaks, I decided it was time for a throwdown between these two cookers. First, I loaded each of them with the same amount of lump charcoal and lit them each in two places with my MAPP torch. Next, I installed a platesetter, disposable drip pan, and upper & lower cooking grates in each cooker. Once they came up to temp, I loaded each with pork steaks and settled in to make a few observations. Fire control - Advantage Big Green Egg. This was no surprise and I've blogged about it here before, but I find that temperature/fire control is much more consistent on the Big Green Egg and requires much less tuning. I find myself chasing the temperature on the Bubba Keg... a lot. In fairness, maybe I'm trying to apply too many BGE principles to managing the fire on the Bubba Keg. Heat Retention - Advantage Bubba Keg. I thought my BGE was well insulated, but then I discovered the Bubba Keg. I suppose the double walled construction with insulation makes the difference. I can lay my hands on the outside of the Bubba Keg with it at 300* and it's cool to the touch. The ceramic on the Big Green Egg is cooler than a metal cooker would be, but you still can't hold your hand on it for long at that temperature. Cooking Environment - Advantage Bubba Keg. The BGE has always produced moist and flavorful meat, so you can imagine my surprise on Sunday when I discovered that the Bubba Keg was even more moist. I don't use liquid in my drip pans, so I was shocked when I lifted the lid on the Bubba Keg after 2 hrs to find the pork steaks even more moist and juicy than those on the Big Green Egg. In fact, I'm still wearing the burn on my forearm from the escaping steam. Taste Test - Advantage Bubba Keg. As much as I'm an advocate for the Big Green Egg ( I've convinced about a half dozen people to buy one), I was stunned when my guests identified that the pork steaks from the Bubba Keg were more moist and tender than those from the Big Green Egg. In fairness, they were all good but there was a difference. For this particular attempt (and much to my dismay), the Bubba Keg is the clear winner. However, I'll perform additional side-by-side tests to see if the results are consistent. Additionally I haven't weighted any of these areas but considered them equally for now. Every individual will value the characteristics differently and for me the fire control issue is huge and would outweigh the Bubba Keg advantages as it was only slightly better in the other areas. Both cookers do a fine job and there are many other characteristics to consider when selecting an overall winner. But I'll save those for another day. Update: Here's a link to Round 2 of the Bubba Keg vs. The Big Green Egg. Although I'm very happy with my Big Green Egg, I've been thinking about a cabinet style smoker for capacity. A few times I've been asked to cook for parties and the like and I just don't have the capacity that I need to be able to take on those jobs. So, I've kinda been thinking about my next cooker. On Friday afternoon, I headed out to West St. Louis County to check out a local grill and fireplace shop that I've heard about. They're listed as a dealer for Backwoods, Cookshack, Traeger & Big Green Egg grills & smokers, just to name a few. The shop isn't huge, but they have a decent amount of their space dedicated to BBQ gear, including everything from gas grill parts, grills & smokers, smoking woods, charcoal, rubs, and sauces (the rest is dedicated to fireplaces and the like). I found the staff to be pretty knowledgeable about the gear they sell and when I told them about Grill & Barrel, they quickly turned me onto the St. Louis BBQ Society and some local events that are planned for later this year. I picked up a few things from the store and I plan to go back and get a first hand look at a Backwoods Party in a couple of weeks. So if you're in the St. Louis area, support your local dealer and give the guys at St. Louis Home Fires a shot the next time you're in need of some BBQ gear. Sorry I've been mostly radio silent for over a week. I took my family on a beach vacation for a little R&R (and that doesn't mean ribs & roasts as was suggested by a friend of mine). We met up with family at a beach rental in Florida and as the master of the flame, I was given the responsibility for all outdoor cooking. So I went on the prowl for what the rental had to offer in the way of a grill. My hopes were momentarily lifted when I found the ceramic cap to a Big Green Egg. But if the rest of the egg was there, then it must have been locked away in the "owner's storage". I found what I expected, a $100 gas grill like you'd find at a discount store. And due to the exposure to the salty air, it was rusting through with burners that were in bad need of replacement. In fact, the whole thing should have been replaced. Nonetheless, I soldiered through a series of grilling events. Hamburgers, fish & shrimp, and steaks all turned out okay. However, I sure got a whole new appreciation for what I cook on at home. Next time, I just gotta figure out a way to get a cooker to the beach with me. As I've mentioned here a number of times, I cook primarily on a Big Green Egg. For the first two years that I owned this cooker, I simply used a bucket and the BGE ash tool to rake the ashes out of the bottom of the cooker. That worked great until I built my new egg table. Now, it's impossible to place bucket under the BGE directly, making ash removal a bit tougher. A friend of mine happened to be in the BBQ store recently and came home with tales of an ash pan that was curved to fit the outside of the Big Green Egg. So, I acquired one of these for myself. This works like a champ and has made ash removal much easier now the egg is on the new table. After implying that I needed to get a first hand look at a Bubba Keg to answer some of my questions (Review: Bubba Keg), the folks there obliged by sending me an evaluation unit. And today, I completed the assembly and cooked on it for the first time. The unit was really well packaged. Based on my experience with a Big Green Egg, I was glad to find that the lid and hinge were pre-assembled and attached to the body of the cooker. The directions were straightforward and the Bubba Keg was easily assembled in just a few minutes. The only time I wished for an extra pair of hands was during the placement of the cooker on the stand. It slides onto the stand just as it slides into a receiver hitch for transportation on your vehicle. I was able to accomplish this by myself, but I'd recommend finding someone to help. Once I got it assembled, I coated the cooking grate and top damper (these are cast iron) with cooking spray. Then, I added just a small amount of lump charcoal in the firebox and lit it with my MAPP torch. It quickly came up to temp as I expected with this basic design. In fact, I was at 500° in about 15 minutes. I let it cook at this temp for almost two hours just to burn the "new" off of it and to season the cast iron parts. Once I felt it had seasoned enough, I put a few burgers on for dinner. It cooked nicely and my family couldn't tell that I hadn't cooked dinner on my BGE. I look forward to cooking on it some more. 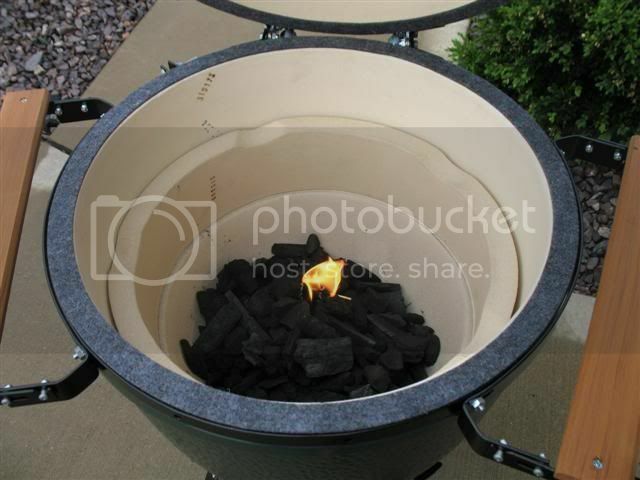 I can't wait to transport it on a couple of outings that I have coming up and to try low & slow cooking. As a side note, I received an update from the folks at Bubba Keg that the price for the unit has been adjusted to $599. It's now available at Home Depot and select Sam's Club stores at that price.